This year will for me be a milestone in my life, I have begun the year by moving from home to Loughborough full-time. In 2016 I made the decision to train with the Loughborough University Triathlon Squad, however I was still living at home (45 miles away from Loughborough). Back then there were a number of factors holding me back from moving; finances, work, maturity and general worries. I have now made the big move and I share a house with other triathletes and train with the squad most sessions. I really do not miss spending the majority of my days driving back and forth from Leamington Spa, however I do miss my family (my dog Oakley A LOT!) and home comforts of my food and ironing being done for me. Although I am not studying at university, I am still focusing on my education. This month I passed my qualification in BTF Triathlon Coach Level 2, to go alongside my swim teaching qualification I achieved last year. I’d like to challenge myself with some more qualifications in the autumn after my competitions have stopped. I’m just trying to work out what will complement the qualifications I already have. I’m already loving using my new set of skills daily and I’m still enjoying teaching young children to swim, it’s so rewarding. Swimming Teaching is my primary source of income at the moment, but hopefully soon I will be able to take on some triathlon sessions (I’m still guilty of having to ask the mum and dad for a little help now and then). This year I will race in the under 23s and seniors categories, this will include a mix of distances; sprint and Olympic. I hope to race more sprint distances and a few Olympic distances in order to break myself and my body into it gently. France run a Grand Prix league which attracts a number of international athletes who compete in around four race, if chosen. Teams will have a number of athletes that will sign up for their team and it depends on the individual schedules and capabilities to who makes the team, this year I will race for Tri St Amand Dun ’18. I’m really excited to race as I feel I really thrive in a team orientated situation. My main goal this year is to qualify for European and Worlds but to also remain injury free. I haven’t had much luck these past few years with injuries, so I hope 2017 will see a new robust me. Strength and conditions are going to key and I’m going to have sport massages weekly. My cooking skills are also improving so I hope my nutrition will improve, I still need to focus on calming my sweet tooth. I am so thankful of my sponsors and this year is more important for me than any others, as I am supporting myself with no financial funding. So I am extremely thankful and appreciate to the kit and equipment as that really helps me out as there is such a large amount of buy in this sport. A big thank you to Liv and the team; Collette, David, Ricki and Simon – Your support and friendship is amazing! 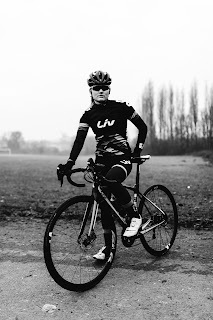 My next blog post will be about the great bikes and kit I have been lucky to receive from Liv. Last year I ripped my wetsuit towards to end of the season and Huub were there to rescue me with a new one and a long list of swimming kit and bags. Their support over the past couple of years has been amazing. A big appreciative thank you to Liv and Huub.